Restricting in-work benefits to EU migrants would make a huge difference to EU migration. This is far from certain. There is no direct evidence that welfare is a prime pull factor for a significant number of EU migrants coming to the UK. "I think it makes a huge difference if you deal with the issue of migrancy through welfare … Taking out part of the pull factor of people coming over, who can declare themselves to be on zero earnings and getting tax credits and maybe doing cash-in-hand elsewhere, these are all problems the country faces and we need to deal with". There is no direct evidence on whether welfare has acted as a "magnet" encouraging EU migrants to come to the UK, and gathering this kind of evidence is tricky. Availability of jobs is thought to be the main pull factor for migrants coming here, according to the Migration Observatory. Part of the difficulty in getting evidence for EU migrants as a group is that research tends to look at the EU-born or EU nationals. Only a small share of the EU-born population living in the UK report that they claim tax credits. This is self-reported data, which is known to undercount benefit recipients. We don't know by how much. Assuming this data is broadly correct, if in-work benefits were acting to encourage migrants to come here then this suggests that restricting them wouldn't directly affect the decision of the majority of EU migrants to come to the UK. The government has recently given a higher figure of around 40% of EU migrants claiming in or out-of-work benefits, but commentators have said the evidence behind this is not completely clear. Sir Nickell and Mr Duncan Smith's comments were made in relation to restricting access by EU migrants to in-work benefits in the UK. Access to benefits by EU nationals depends on their working status. If they're deemed to be a "worker" in a job which is considered "genuine and effective", they get immediate eligibility for in-work benefits like tax credits and housing benefit. EU nationals arriving here without a job can't access out-of-work benefits as easily. Our briefing written in collaboration with the Migration Observatory explains this in more detail. As for whether migrants can "declare themselves to be on zero earnings" and get tax credits, we've asked HMRC for clarification on which tax credits they would be eligible for. In the first quarter of 2014, EU-born people of working age were more likely to report receiving tax credits (14%) than the UK born (11%), according to the Migration Observatory's analysis of the Labour Force Survey. The largest gap in rates of claiming was between people born in countries that joined the EU before 2004 and since 2004. 18% of people from new member states reported receiving tax credits compared to 8% from the pre-2004 members. As we've said, that's based on self-reported data, which is known to undercount benefit recipients. Comparing rates of take up in this way assumes that undercounting is the same for all groups. The availability of jobs is thought to be the prime factor in migrants' decisions to move, according to the Migration Observatory. It's plausible that just as potential migrants take into account wage levels, they may also take into account the possibility of getting in-work benefits. Some analysts have argued that the financial incentive to migrate would therefore be decreased if these benefits were restricted. In practice, however, it is unclear how significant the effects of such a policy would be on the number of people choosing to migrate. Only a small share of the EU-born report claiming tax credits (14% in 2014, as described earlier). This suggests that the number of people whose initial migration decision might be affected by the immediate availability of tax credits is only a small share of the total. Both EU and non-EU migrants are underrepresented among people receiving key out-of-work benefits, when compared to the share that the EU and non-EU born make-up of the whole working-age population. Claimants from new EU member states have increased in recent years but remain a small share of the total, rising from 0.5% of claimants in February 2011 to 1.3% in February 2014. 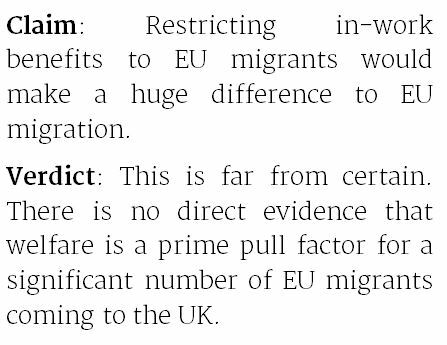 This factcheck uses sections of an election briefing written by the Migration Observatory at the University of Oxford in collaboration with Full Fact.